Summertime, and the trading is easy. U.S. stock futures were jumping Monday, and Kinder Morgan (KMI) shares were up by 10% in premarket after the energy infrastructure company announced it was hiking its dividend and would spend more than $40 billion to buy out smaller shareholders. 1. Risk fears fade: Investors have been worried about geopolitical uncertainty in recent weeks. 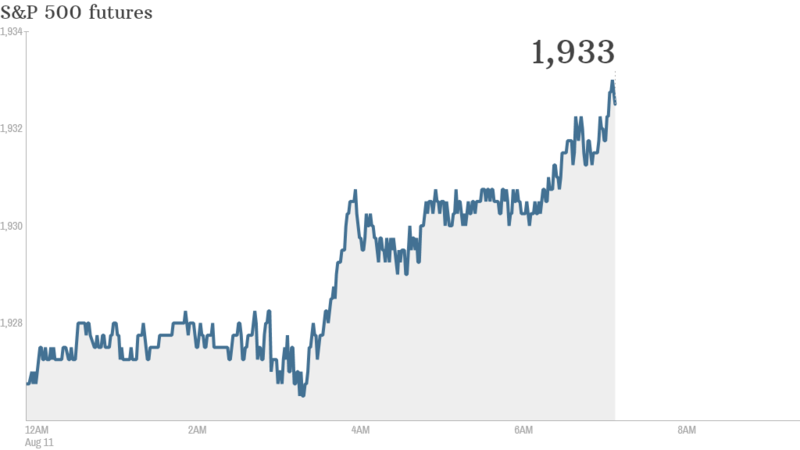 But U.S. stocks closed higher Friday and it looks like markets are shaking off some of those fears. "Markets continue to differentiate between the humanitarian crises in Gaza and Iraq, which are not market drivers, and the Ukraine conflict which has far more potential to spill over to asset prices. The lack of news on the last of these supports the risk bounce," said Kit Juckes, a market strategist at Societe Generale. On Friday, the Dow Jones Industrial Average and the S&P 500 both gained more than 1%, while the Nasdaq advanced 0.8%. 2. International markets: Turkey is in the spotlight Monday after Turkish Prime Minister Tayyip Erdogan reportedly won the race to become the country's first directly-elected president. Market reaction has been muted, with the main Turkish index pointing slightly lower. European markets were all higher in early trading. The main markets had declined Friday. Asian markets also closed the day with gains. 3. Earnings: Priceline (PCLN) and food service distributor Sysco (SYY) will report earnings before the open. Correction: An earlier version of this article incorrectly said American Apparel was set to report earnings on Monday.